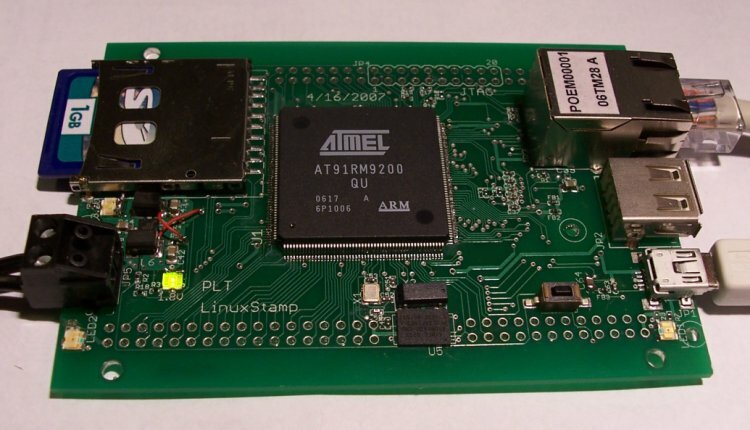 The Linuxstamp is designed to be a general purpose processor module. It is designed to work as a stand alone module (SD card, Ethernet and USB/Serial converter are all on the module). This allows all initial development to be done without a motherboard, but for integration into a specific project a motherboard with specific features could be designed. Check out the start of the first mother board for the Linuxstamp, Mboard 1. Warning!!! Use this design at your own risk. The power supply for the board is based on the Linear LTC3407-3. This is a very compact high frequency switching power supply. It has both a 3.3v and a 1.8v output. It does have a very tight input range 3.3v-5.5v. The Micrel PHY also needs 2.5v, but this is provided by an internal regulator. Currently a regulated 5v must be used to power the board. Talking with Jeff from Jendy Labs it seems like POE (Power Over Ethernet) is a good idea. Wikipedia has a good general description of POE. The basic idea is that POE provides 48v and up to 13 watts, more than enough power for the Linuxstamp. The problem for the module is that a 48v -> 5v power supply is not small or cheap. In order to take advantage of POE without increasing the board size I found a part from Transtek Magnetics that is made for POE and has the rectifier built into the jack. The 48v lines are then connected to the pin header. This will allow a motherboard to integrate a POE power supply. The mini-USB device port on the Linuxstamp does not connect directly to the AT91RM9200 it connects to the FT232R chip. The FT232R is a USB/serial converter. The FT232R chip has drivers for both Windows and Linux, but the Linux drivers are included in later kernels. Drivers for Mac OS X are available here. When you plug the Linuxstamp into your host (Linux) machine a device should appear /dev/ttyUSB0 (I think the postfix number will increment as you add more devices). /dev/ttyUSB0 will behave as any other serial port now. Minicom is the standard program to access the serial port in Linux. The first time you run minicom you will have to be root in order to do the setup, after that you can change the permissions on /dev/ttyUSB0 so any user can run minicom. To enter configuration mode in minicom type CTRL-A o, now scroll down to Serial port setup. Use the letters to navigate. You will want the device to be /dev/ttyUSB0 and Bps/Par/Bits to read 115200 8N1. Both hardware and software flow control should be OFF. Connection to the board is important for loading Atmel's tiny program and u-boot, but once the board is working it might not be as important. The default installation of minicom does not automatically include the XModem file transfer module 'sx' which you will need to send files. It is part of the Linux package named lrzsz (lrzsz). Just type 'sx' at a command line to see if it is installed. If not, install the lrzsz package and minicom will find and use 'sx' automatically. Connect the USB cable to LinuxStamp and start minicom from a terminal window. Boot the LinuxStamp. You should see CCC... on the minicom console, with a new C every second or two. Hit Enter twice. This will stall the bootloader, and the CCC... sequence will stop. It will also synchronize the USB/serial converter. Hit Ctrl-A Z S sequence to bring up the file transfer dialog in minicom. Select XModem and navigate to and select your u-boot.bin file (space bar). Hit Enter to start the xmodem transfer in minicom. Press and release the reset pushbutton on the LinuxStamp. The transfer should happen very quickly (a few seconds). Immediately hit Enter twice when you see the transfer complete. You *must* do this very quickly (within 1 second or so), and you *must* hit Enter twice. The first time exits the minicom file tranfer dialog, and the second time stalls the newly-loaded U-Boot program so that it doesn't try to auto-run the not-yet-loaded Linux kernel image. You now have U-Boot in RAM, but not yet in flash. However, U-Boot is a lot nicer than the hardware bootloader, so you can now use U-Boot to load itself into flash by using the U-Boot menu and retransferring the u-boot.bin file again. This second time, the transfer will end up in flash, and will persist through poweroff/on. Another alternative is to use HyperTerm on Windows, which works fine with the Hardware boot loader. If you are updating the Darrel Bootloader, note that the loader only has a short delay after you initiate the "receive" (on the loader) after which it send out the "ready to receive" signal. As a result, you'll need to be rather quick to initiate the Xmodem "send" (on HyperTerm). If you are seeing time outs on HyperTerm when you try and send the loader.bin file, you are probably hitting this problem ... you need to have initiated the send before you see the "C" on the screen from the bootloader. Nfs (network file system) and tftp (trivial file transfer protocol) are two servers you will want running on your host machine. Nfs is useful for hosting the root file system of the Linuxstamp. Tftp is useful for u-boot to retrieve the kernel from. There are many other websites on nfs and tftp, but I will try and go over a simple setup. I would suggest being behind a firewall before trying either of these setups as neither is secure. I wrote this using a Fedora 7 system. First make sure you have nfs installed. Now edit /etc/exports you should add a line like this /path_to_nfs_root/ *(rw,no_root_squash,insecure). Now restart nfs. Now on to tftp. Make sure it is installed. This will create a file /etc/xinetd.d/tftp. In this file you will want to change disable from yes to no. Now make a test file. "eval `cat arm.dat gcc-3.4.5-glibc-2.3.6.dat` sh all.sh --notest"
In the "arm.dat" file I changed the TARGET to "arm-linux" (By default u-boot looks for arm-linux-* tools). Now if you run "demo-arm.sh" you should get a cross compilier. On Debian-style-systems you need to run something like apt-get install build-essential bison flex to get the above to work. The AT91RM9200 has several features the facilitate easy booting. There is a good description of the booting order here. Atmel provides a tiny program that lives in the Dataflash and loads u-boot (see next section). First we need u-boot (doc) source (git) (formerly on sourceforge) (I was using version 1.1.6 - this is an old version). If you have not yet built a cross compilier now would be a good time to do so (See the cross compilier section above). Now you can do a test for the Atmel AT91RM9200 DK board. This should give you a "u-boot.bin" file. We will have to write a board specific configuration file for the Linuxstamp. We should be able to base it off the the Atmel DK board. If you look at "/u-boot-1.1.6/include/configs/at91rm9200dk.h" you can see the configuration for the DK board. Busybox provides the necessary utilities (e.g ls, cp, etc...). After you have downloaded and unpacked busybox we are ready to get started (I was using version 1.4.2). If you have ever built the kernel for your desktop, then cross-compiling the kernel isn't that much harder. First get the latest kernel from kernel.org (I was using 2.6.23-rc9), then get the AT91RM9200 patch from here. After you unpack both of these you can apply the patch. From a Fedora 11 Live install you need the following packages: gcc, gcc-c++ and qt3-devel (for xconfig). The ecbat91 is the closest to the linuxstamp. There isn't much you need for a minimal filesystem. I suggest creating a staging area to create the filesystem. First you need the libraries generated by the cross compiler. On my machine they are located at /opt/crosstool/gcc-3.4.5-glibc-2.3.6/arm-linux/arm-linux/lib. Next you will need busybox, and we saw in the busybox section we can tell busybox where to output the files (use the root directory of your staging area). The last file we need is /dev/console. /dev/console is a special file used to bind a device driver to a file. As such we use the mknod command. The c says this is a character device. The 5 is the major node, and the 1 is the minor node. For development the most convenient way to work is by mounting an NFS root file system. Another easy way to deal with the root file system is by mounting it on either a USB drive or SD card, but if you want a stand alone system you will want the root filesystem to come from the onboard Dataflash. There are several steps to do this. The Dataflash on the Linuxstamp is 8MB. A little under 2MB is used for the bootloaders and the Linux kernel. This leaves about 6MB for the filesystem. The filesystem I am working with is about 10MB, so we will need to compress the filesystem. One method of doing this is to use the initramfs function in the kernel. The kernel expects the image to be a gzipped CPIO archive. In the kernel source there are tools to create the CPIO archive. First we must create a file list from our file system (presumedly this is just the root of your current NFS mount). Now copy initramfs.cpio.gz to usr/initramfs_data.cpio.gz, and run the normal kernel make. You will notice that uImage is much larger (size = kernel + fs). If want the full Linux enviroment your used to then you can try out Debian on the Linuxstamp. A working Debian filesystem can be found on the ftp site. If you looking for more features than the minimal filesystem, but don't need the full Debian system then ptxdist is right for you. The folks over at Pengutronix have done a very good job creating Ptxdist, a simple tool for building an embedded Linux distribution. If you want to test it out with the Linuxstamp, you can grab a build of the filesystem and kernel. If you want to try out ptxdist yourself, you can get the Linuxstamp project here. One of the first non busybox tools you will want is SSH. Dropbear is a small SSH client/server. I was able to get version 0.50 working. You will also have to have the devpts filesystem mounted. With the 2.6.27 vanilla kernel the ralink USB driver works very well. I've been using the AZIO AWU254 without any problems. If you need some guidance figuring out how to 'bit twiddle' the GPIO (General Purpose I/O) pins on the at91 processor, here is a simple example with make file. If you have your arm-linux cross compiler configured with CrossTool just unpack this file into a folder and type 'make' to generate the executable binary. This example shows how to set and clear output pins read input pins. It is very easy to use the Linuxstamp with a RC servo controller like this one from pololu. In this setup the board is powered from the USB connector, so I was able to use the power terminal to power the pololu module. On the under side of the pololu module I connected the servo power with the chip power. The only other thing that is needed is the serial TX line from the Linuxstamp (yellow wire). 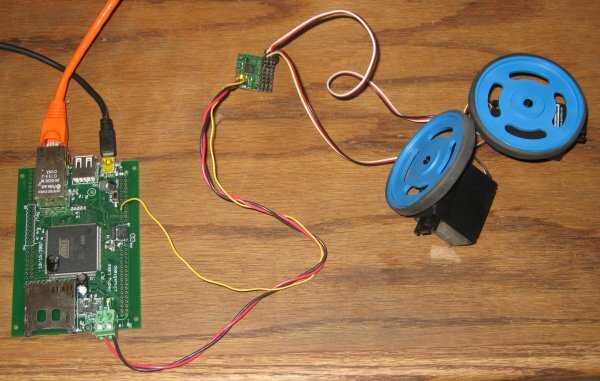 I created a very simple program to run the servos. The following example would set servo 0 to a speed of 54 (64 is stopped) with an acceleration of 2. ECB AT91 This is another open source project similar to the Linuxstamp. They have some very good documentation. The AT91RM9200 has 2x USB host ports and 1x device port. I bring out one of the USB host ports directly from the chip to a USB A connector. There is also a mini USB B connector on the board this is connected to the FT232RQ (USB/serial converter) which in turn is connected to the debug serial port on the AT91RM9200. So the linuxstamp can be both a USB host and a USB device. The FTDI driver creates a device /dev/ttyUSB0, a character device (this is how the Linuxstamp shows up on the host system). You can read/write to it as if it was a terminal, tty, or serial port. Above section on "Minicom & the debug port" points to communicating with the linuxstamp from a host computer. The FTDI232 chip connects to the mini-USB port. This page was last modified on 14 December 2012, at 13:29. This page has been accessed 203,035 times.